Aby is 10 years old. She is very young 5th grader and she has the mentality of a kid. I’m a firm believer that she is at a very sensitive age and she needs guidance and structure but there isn’t much need to kill her in the workout realm. Running should be fun for her and if she doesn’t enjoy it then we encourage her to try band, choir, dance, martial arts, etc. whatever she would like to do to keep moving. Active children are GOOD, it’s tough on us but it really does keep them out of trouble. Aby started asking to run races when she was really young, probably 4 or 5. I said, “No”. I kept telling her she couldn’t run a race until she could pronounce it. At the time, she called 5Ks a “K-5”. 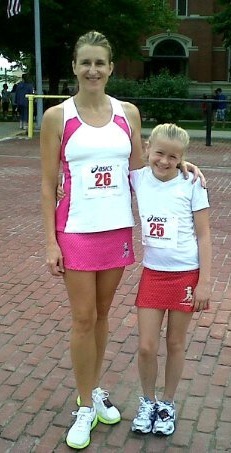 Once she was 6, I let her do a few kid races, like the Mini Muddy Buddy. 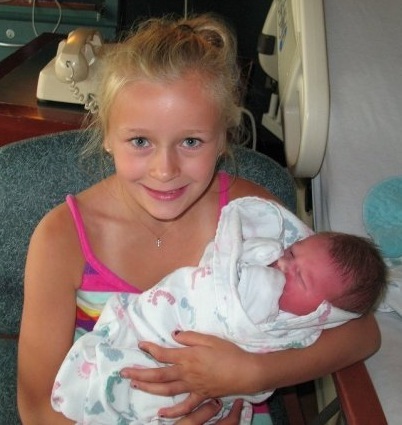 When she was 7 & 8, we were dealing with pregnancy & new baby fun with Mr. Michael. When she was 9, I finally relented and let her start racing. 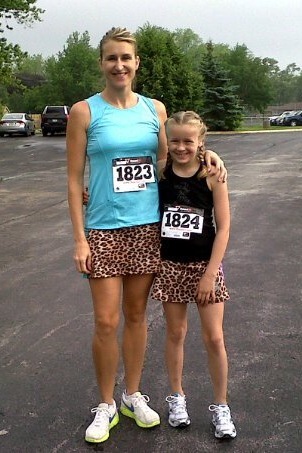 Her race debut was the Ringing In Spring 5K in Valpo in April 2011 where she took her age group for the win. She didn’t stop racing, or placing, all summer. Ringing in Spring, Devil Dash 5K in Peotone, PTO 5K in New Lenox, Mokena Summertime Stride, Courthouse Classic in LaGrange, IN, Fort4Fitness 4 miler in Ft Wayne, IN. She ran these all herself, not with me. I ran my race, which some say is “mean” but my theory is that if she was old enough to want to do it, then she was old enough to push herself to the finish. And she did. Each and every time. Apparently, the timing was right, she was having fun and we soon got notice that 5th graders could join the middle school kids for Cross Country. Wow, that was new; it wasn’t like that when I was a kid. So after a great summer of road racing, Aby turned 10 and moved into school sponsored running. Things changed. She was having fun during the summer, I would encourage her and cheer for her and it was very low key. The crowds were big at our local 5Ks so she always performed well in the pack and did well in her age group. Now she was competing with kids much older and stronger. She struggled but kept her head up and kept running. Although her school program was very underdeveloped, there were several young girls on the team who bonded and fought thru together. I was always around but since I was “mom”, Aby didn’t think I knew anything. If I tried to help, or give advice, she would roll her eyes, so I settled for the supportive “mom” roll and let her do her thing. 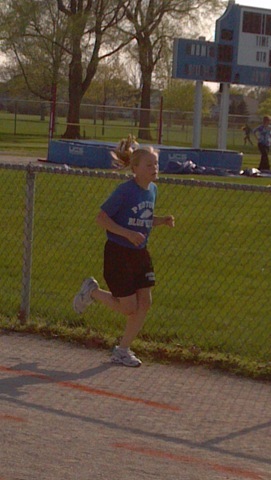 Although, she had a nice sprint to the finish in the last 100 meters, the race was over way before then. Hubby & I knew she was not even close to reaching her potential but she was frustrated so we continued to be supportive, encouraging parents. I told her that I would help her during the summer if she wanted but she didn’t care. Her best 1600 (mile) on the track was a 7:16. That’s a good mile time for anyone but not competitive with the girls on the track. Last night I did my first triathlon brick. I biked 10 miles, then put on my running shoes and quickly ran to the end of our road & back. It was a whopping 1.4 mile run. Stellar, I know. When I hit the drive on my return, Aby wanted to be dropped a mile from the house to run a timed mile. So hubby dropped us off. My goal was to get her under 7 minutes but I didn’t tell her that. She ran hard, but not uncomfortable, I could tell she was running harder than I had seen her run all track season. I was watching our pace. She was fading. I was encouraging her to stay with me. To push. To just hang on. To focus. I also gave her tips to focus on her arms and her feet would follow, to run with her abs and not her legs. I slowed the pace to reel her in closer so she wouldn’t give up. I hit the mile at 7:05. She was a few steps behind, probably a 7:07! Not under 7 but damn good! Go Aby! This entry was posted in Running, Triathlon and tagged coaching your own kids, Mini Muddy Buddy, parenting young runners, Running with your kids, young kids on the run by tootallfritz. Bookmark the permalink. I hope maybe some day I’ll be blessed with children that enjoy running as much as I do. Love the pictures of you and your daughter. My 4 year old just did his first kids race and at my next 5K he was sad because we didn’t sign him up for the fun run. I think there is definitely a fine line between encouraging and pushing, but it sounds like you are doing a great job so far and are a wonderful example for her. I try to err on the side of caution. I just don’t want her to hate it further down the road and feel like she is doing it to please me. Mix it up. You’ll be able to find a road mile here and there. Kid’s triathlons & duathlons? 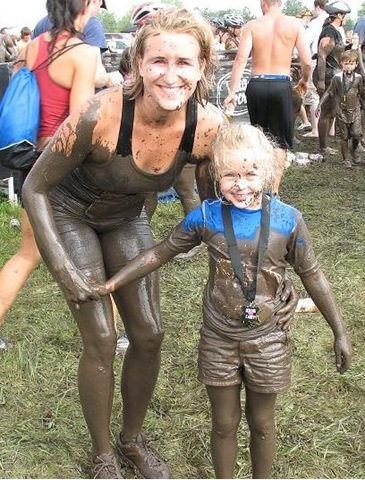 Mini muddy buddy/ mini mudathon (if those are out there)? Lot’s of speed play too- play tag with her on a football field, funny fartlek. Get her to run short and fast as part of play without her knowing it and her mile times will come down even more. Although 7 minutes at her age is really good. Love the pictures of the two of you and of the BIG smile on her face by herself!! I think the way you are approaching this is perfect. 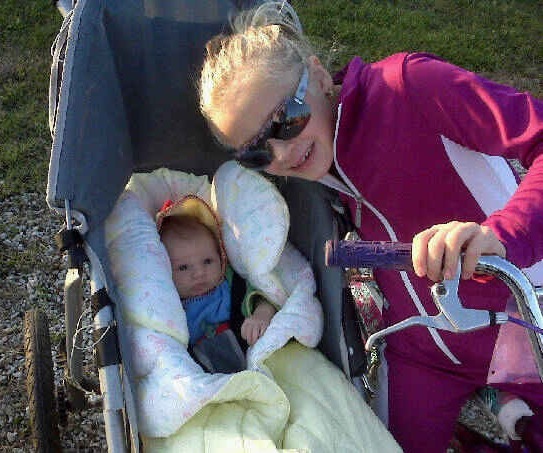 Possibly contact Jamie Parks, on Facebook, they are in Tinley Park and have a daughter close to the same age maybe a little older, she does a lot of running. She ran Ragner last year, with her Dad’s team. They should be able to give you a lot of advice and her some inspiration. Great family!!! Also we start speed training at Chicago Christian high school on Wednesdays at 6:00 pm, May 23rd. If you need I can do a friend suggestion in Facebook. I think she is doing way awesome!! 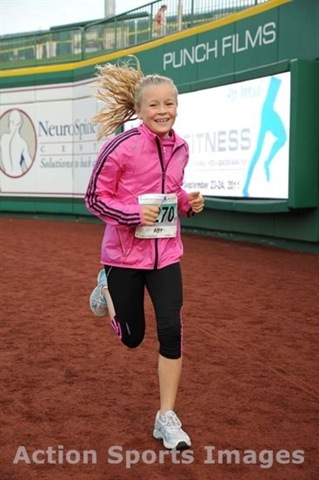 I know Annalyn Parks, has been competing in the 10-14 age group and has been training for the Tinley Dualathon. She just this month did her first 7 mile run. She was handing out medals at the end of the Southwest Half, her Dad Jamie pushes her Mom in the wheelchair, I am sure you’ve seen them. They are a nice family. I love that she wants to run on her own! That is so cool! I bet she will learn, as she gets older, to push it harder, if she wants! It’s great that she is having fun now! Agreed, she will either want to run harder or she won’t. I just want her to be smiling and enjoying it. So far, so good. Well TTF…at her age you got keep it fun for her to keep at it. Get too sophisticated and regimented in the training and it might break her “spirit” and initiative. She’s got a good start and I would be pretty hard-pressed to keep up with her. But…from my perspective…you are incorrect to call the mile a “sprint” race. It is a legitimate distance race, albeit quite short, but it requires a similar distance approach in the sense of the start through the first half of the race….that is….not run all-out and save that for the last two laps. It is a race where the fastest times are running at 100% HR-max, but the psychology and strategy to do well in the mile (and 5000m as well) is not to go all out from the start. You run very hard and fast….just not all-out. That takes some learning to figure out…but try to encourage her not to even try to keep up with the cheetah(s) at the start, but just hang back a bit and find something more comfortably hard to hold without losing any distance. Then after the 2nd lap, and heading into the 3rd…if done correctly…should be able to pick-it-up a bit and maybe start gaining some lost ground. You save the “all-out” for that last 200m. Of course…it depends on the field you running against….but the point here is to use the others to find what works best for you. Since you noted she “fades” at the end….that’s classic evidence going out too fast from the start. Warm-up before the start is also key to posting your fastest times. Let me know if you want tips on that for her. 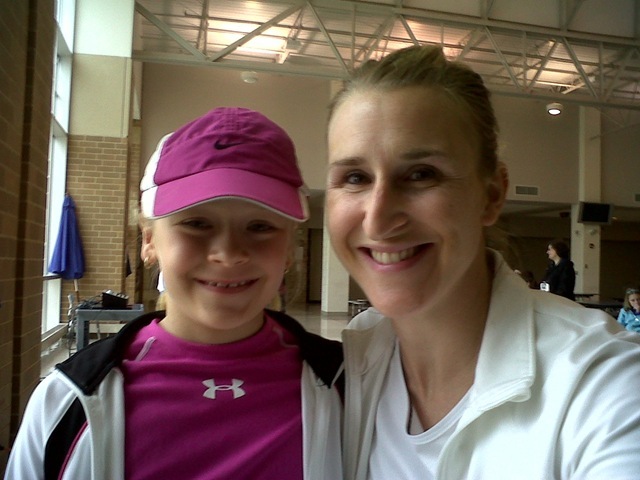 Maybe she will listen to you if you say their from “Coach Frogger”….LOL! Or…show her this post! Finally….the training that would help her the best is not to run the mile distance home and post that goal of 7:00 or so, but rather do the 400 and 800 interval repeats run at a faster than mile pace. Over time….this will give her that “oomph” to hang-in there and still have some gas in the tank for the last 2-laps, and probably run that 7-min, or probably even break 7-min mile. If she really wants to run a “fast” mile for her age…then Frogger will help you work out some routines to do related to some goal race or event she wants to do. But…I don’t want the kid “rolling her eyes” to you….so she has to understand what you tell her is from the coach! When I get caught up with my course measurement jobs and get back to run training (haven’t run since Boston April 16th) probably even be willing to come out and meet ya both at track in Frankfort or elsewhere and do some workout. You and me might even be able to run the intervals with her and not necessarily kill ourselves in the process! LOL! 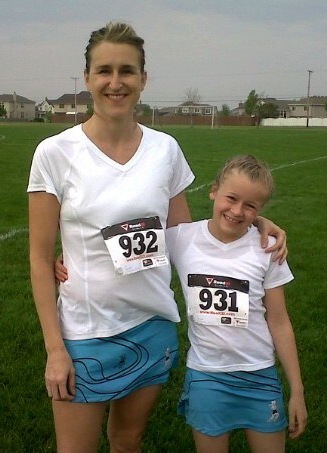 Loved your post cause it really shows you are both the runner and a great Mom! Only trying to help…so let me know if I can be of any help to Aby’s quest to run that fast mile and/or get some looks from some of those other young “cheetahs” out there! My son can run a mile in under 6 minutes (with no training, just whenever they do it at school) and I haven’t been able to get him to join the track team. 😦 (I think I’ve talked him into it for next year! Fingers crossed!) The main problem is he plays football, so he’s forced to take this intensive “athletics” program all school-year long. He doesn’t like the idea of MORE physical torture after school… Can’t say that I blame him. Seriously. Some of these sport seasons are really long too. The track season is on of the shorter ones. And under 6 min miles for no training, that rocks! Good luck! Thanks. I’ve been trying to push him towards track instead of basketball because there’s a break between football and track, but not basketball. He told me today there’s a junior Olympian at the middle school that does a 4:30 mile! That’s crazy. My girlfriend’s son just broke 5 min in the mile. He ran a 4:51 in sectional. He is a 7th grader. That is super fast. A 4:30 is insane. As I try to tell Aby, you can’t compare yourself to those people, just try to learn as much as possible from them while they are around. The break in the winter would be good for him too, if he agrees. And each team needs more than one miler, even if the one miler is of olympic quality. It takes more than one person to make a successful TEAM. Good luck. Too bad you can’t get him in a cross country camp this summer but I know football will be his focus. Awesome! Good luck to all of you but most importantly HAVE FUN! 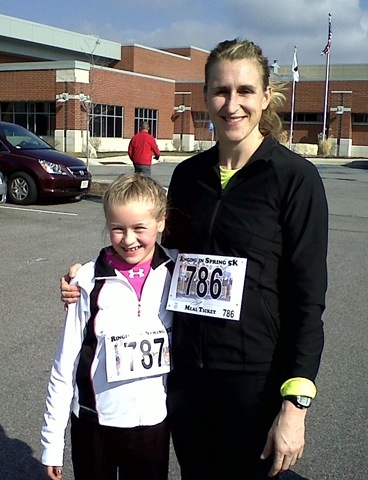 Aby frequently runs races where there is NOT an age group for her. She is older, 10 now so most races accomodate her but she frequently gets thrown in with the kids up to 18 years old. Ugh! Tomorrow she doesn’t have an age group. The first grouping is ages 13-18. So not cool in my opinion.